(Nanowerk News) Outside his career as a noted nanochemist, Lawrence Berkeley National Laboratory (Berkeley Lab) director Paul Alivisatos is an avid photographer. To show off his photos, his preferred device is a Kindle Fire HDX tablet because “the color display is a whole lot better than other tablets,” he says. What he may neglect to mention to the viewer is that not only did he take the photograph, he also helped invent the nanotechnology allowing the viewer to see those brilliant greens, rich reds, and bold blues, all while using significantly less energy. In fact, the Kindle display utilizes a technology manufactured by Nanosys, a startup Alivisatos cofounded in 2001 to commercialize quantum dots. It was in his lab nearly 20 years ago that, along with collaborator Shimon Weiss, Alivisatos synthesized spherical nanocrystals made from a core of cadmium selenide inside a shell of cadmium sulfide. The remarkable thing about these quantum dots was that they could emit extremely pure light of almost any color, depending on their size. Since then, Berkeley Lab’s quantum dots have not only found their way into tablets, computer screens, and TVs, they are also used in biological and medical imaging tools, and now Alivisatos’ lab is exploring them for solar cell as well as brain imaging applications. Because the size of quantum dots can be easily “tuned”— different size dots emit different colors—the realm of possible applications is vast. “There are many thousands of academic research groups around the world using quantum dots regularly,” Alivisatos said. The displays in most electronics on the market today use liquid crystal display (LCD) screens, which typically involve shining a white light through a series of filters to produce the spectrum of colors. This results in wasted energy. 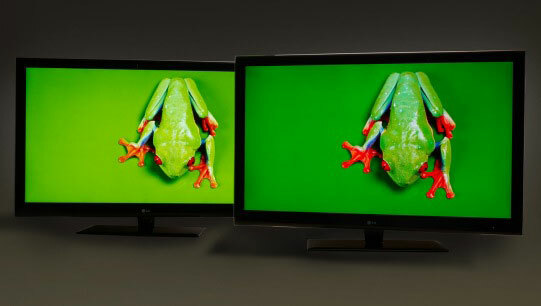 Nanosys’ quantum dots are designed to enhance the color and energy performance of LCD displays. Nanosys says its technology makes displays 20 percent more energy efficient, meaning longer battery life for the device. “Twenty percent doesn’t sound like a huge amount, but when you consider that the display uses half the power of a tablet or device, it’s actually a big improvement,” said Nanosys spokesman Jeff Yurek. Alivisatos’ other quantum dot company—Quantum Dot Corp., which he cofounded in 1998 to commercialize use of quantum dots for luminescent labeling of biological tissues—has since been acquired, and that technology is now found in biological and medical imaging tools made by Thermo Fisher Scientific. Meanwhile, he continues to work on quantum dots for other applications. One of the main areas is brain research, the subject of a major scientific initiative announced by President Obama in 2013, Brain Research through Advancing Innovative Neurotechnologies (BRAIN).